An injection molded elastomeric diaphragm that constantly rolls and unrolls over the drive shaft of a mixer is a critical component in a patented single-use mixing system that enables pharmaceutical manufacturers to prevent cross-contamination while eliminating the need for cleaning and sterilizing traditional stainless steel equipment between batches. HyNetics Corporation introduced its first system of this type in 2002, but for the diaphragm it recently switched from a conventional thermoplastic elastomer (TPE) to Medalist MD140 medical elastomer from Teknor Apex Corporation. The bell-shaped diaphragm is welded to a polyethylene bag that serves as a mixing chamber. It provides a seal between the bag and a shaft affixed to a mechanical drive that is part of the permanent hardware for the HyNetics system. Inside the bag, the shaft connects to a slotted disk which moves up and down to provide mixing action. To maintain a seal during each up-and-down cycle, the diaphragm rolls and unrolls over a mandrel located below the diaphragm. HyNetics supplies the bag, disk, diaphragm, and other components as a disposable assembly used for a single pharmaceutical batch. Hynetics Rolling Diaphragms. Bell-shaped diaphragm made with Medalist® MD-140 medical elastomer is shown standing alone (right) and as part of assembly (left) including shaft and slotted metal mixing disk. The polyethylene mixing bag (not shown) is welded to flange at the base of the diaphragm. "We switched to the Medalist medical elastomer for the diaphragm after conducting an extensive search for a compound that would weld readily to polyethylene, be free of animal-derived materials such as stearate lubricants, and provide superior mechanical properties," said Kenneth L. Bibbo, Vice President of Operations for HyNetics. "In view of the dynamic function of the component, we were particularly concerned about eliminating stress cracks that had occurred with the earlier material." The Medalist compound proved highly resistant to stress cracking. "We subjected diaphragms made of each material to rolling/unrolling cycles of two per second," Bibbo said. "The standard TPE failed after 50,000 cycles, while the Medalist part continued working through a million cycles." Another issue cited by Bibbo for the previous TPE was that of leachables and extractables. The Medalist elastomer provided greater assurance of purity, since Teknor Apex warrants all Medalist compounds to be free of animal-derived materials, phthalates, latex, and additives not directly required for medical applications. HyNetics reports that its system is used to mix powder/liquid or liquid/liquid ingredient combinations, hydrating powders in five minutes or less and efficiently mixing materials that are difficult to process or are shear-sensitive. The system includes permanent stand-alone hardware in six sizes from 30 to 5,000 liters, with corresponding disposable assemblies. The mixing disk operates by moving up and down, not rotating. Mixing speeds are variable from mild to aggressive agitation, and mixing action is consistent from full to empty. 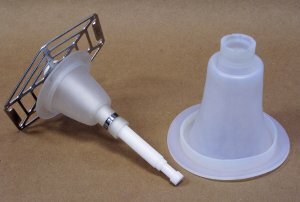 "The diaphragm in the HyNetics disposable mixing system is an excellent example of how Medalist medical elastomers can help material specifiers design, develop and bring their products to market," said Nick Sandland, Senior Medical Market Manager for the Thermoplastic Elastomer Division of Teknor Apex. "The Medalist range of medical elastomers has been well received in the marketplace because it is supported by a comprehensive set of data and regulatory compliance certificates, enabling people to have greater confidence in the materials they are selecting at an early stage in product development."